An average person can install an aftermarket chrome tip onto their truck exhaust system with basic auto supplies. However, in some instances, a professional auto shop might be the best route for installing an aftermarket muffler tip. The first thing that a person will need to do is to choose which type of exhaust tip that they would like to install onto their truck. There are different sizes of exhaust tips, which range from slimmer tips to larger tips, and even dual tips. Furthermore, there are also different materials that exhaust tips are manufactured from; while chrome tips are sought after, they’re more expensive and are prone to dulling. Meanwhile, stainless steel exhaust tips give the look of chrome, while still being capable of maintaining a shine. After the person has chosen the type of exhaust tip that they would like, they might need to obtain welding equipment, if the exhaust tip the person chose is a weld-on tip. Meanwhile, there are also other exhaust tips that are able to be bolted-on. If the exhaust tip is bolt-on, the individual can simply obtain some WD-40, auto gloves, as well as various sizes wrenches and pliers if needed. 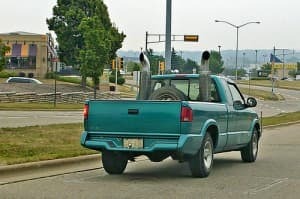 Also, the person should take care to only install an exhaust tip onto their truck after it has been allowed to cool for the proper amount of time first. Alongside the truck being allowed to cool for the proper amount of time, the person should also ensure to engage their truck’s emergency brake so that the vehicle does not have a possibility of budging. After the individual has put on their auto gloves, they may go ahead and lube the end of the exhaust with WD-40 so that the exhaust tip is able to slip on more easily. If the exhaust tip is a weld-on tip, after the individual has put on their welding mask, they can position the exhaust-tip onto the exhaust and begin welding the tip into place. However, if the exhaust tip is a simple bolt-on, the individual may also lube the exhaust end with WD-40 so that the exhaust tip will fit on more easily. After the exhaust tip has been secured into place, it can then be secured onto the exhaust using the supplied bolts. The bolts may be tightened using various sizes wrenches or pliers, depending on the bolt sizes. If all attempts have failed and the individual can simply not weld or bolt on their exhaust tip, they should opt to take their truck to a professional auto shop to install their exhaust tip for them.